Although it wasn’t in my plan to buy a medium-format SLR so soon, one became available a couple of weeks ago on fleaBay. The initial price was a bit high (think KEH retail) so I just watched. The seller lowered the price twice, the second time with a starting bid of $400. So, I set a snipe bid and waited. 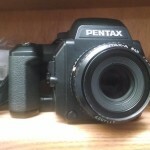 I won the auction and took delivery of a nice Pentax 645NII medium-format SLR. Unfortunately it came with no lens. What use is a camera with no lens? This set into motion a bout of GAS (Glass or Gear Acquisition Syndrome for the uninitiated), which, unfortunately, generally causes gas (yes, the ruminating variety) in the afflictee. One morning about a week ago I found myself obsessing over the purchase of the gear and supporting infrastructure. I’d been waffling for a couple months on film scanners. Nikon Coolscan 9000s are selling for about $3K and up, which is about 3x their original retail price. They’re great scanners, but are discontinued and so parts will become difficult to find sooner than later. 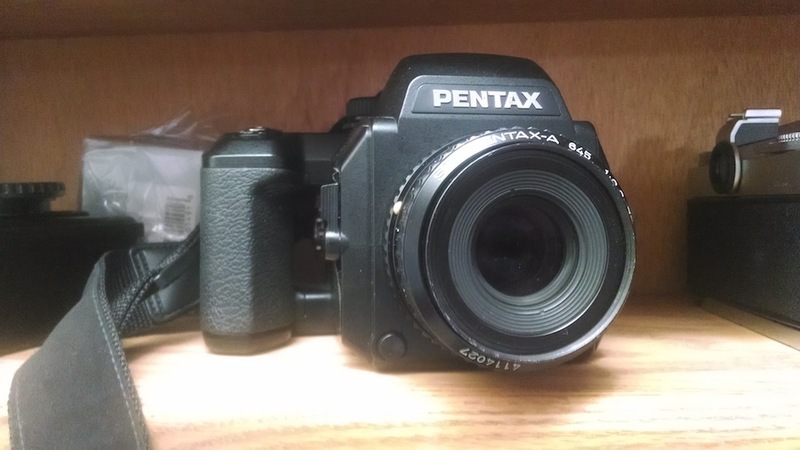 Given I’d bought a medium-format camera, I had two ways to go — I could send out the films for scans (or have them scanned when processed) or I could buy a film scanner. I have a ton of old 35mm negatives and slides that need to be scanned and archived. I am committed to shooting film, both 35mm and medium format (and eventually large format). The test scanner I bought last year is fine for mounted slides, but the film transport is awful. It can be done, but requires a lot of fiddling to get the frames centered. It’s not acceptable. So, I gave myself a mental kick-in-the-pants and pulled the trigger on the last of the medium-format rig and ordered a Plustek Opticfilm 120 film scanner. It has a decent reputation although it started weak. Apparently there was a problem with some of the early film holders that prevented sharp focus of the scanner’s imaging system. They figured it out and although they haven’t completely rectified the problem, they’re testing each unit before releasing it for sale and that solved the problem. I am publicly committing to spending a year working with film in both 35mm and medium format (6×4.5) sizes. I wrote in my journal this morning that I completed the easy part — buying the equipment and researching film and developers. Now it’s time to get after it and go shoot film. It will be work, but making art is work. I can do the technical part. I need to determine whether I can do the art part. I have some early experiments that I’ll use to make some test scans this weekend (or next week if I get out to shoot this weekend). I know I have an archive of black and white negatives from the 70s and 80s somewhere in my house. I want to scan my archive because it contains some interesting images from almost 40-years ago. This is what I said I wanted to do. I’ve been working up to it for about a year. Now the question is whether I can and will do it, or be just another wannabe. I’m fixin’ to find out.